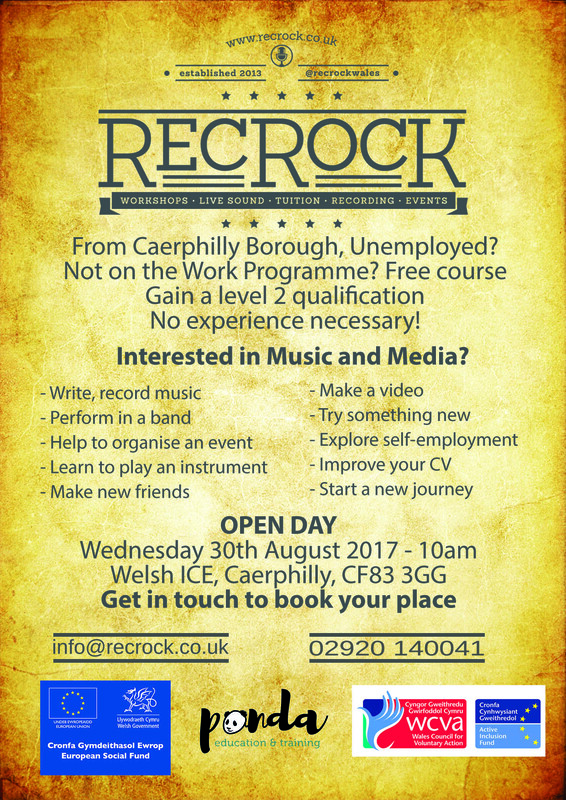 RecRock is looking for unemployed people 16+ not on the work programme who are interested in music and media from Caerphilly. Whether you are the next Dave Grohl or Stephen Spielberg, we want to help you achieve your dreams of creating a career for yourself in the creative industries. Singers, instrumentals, rappers, producers, photographers, script writers, audio editors all welcome. No experience necessary even if you just want to try your hand and make some new friends. The course runs over 8 weeks at Caerphilly Business Park, and aims to give people a realistic work experience in which we will learn to play an instrument, make a short film, put on a concert, art projects, written and recorded an original song. Following on from the course we will find volunteering The Big Cheese and Caerphilly Comic-con. The most interesting vocational based course I have attended. Previously, employment in creative industries seemed out of my reach, but this course has allowed me to access experience in areas I might not have pursued. Check out what some of our participants said on this video. Once performers have built up their set, they will be offered the stage at all major Caerphilly events such as the Big Cheese, Food Festival. We are having an open day on 30th August at Welsh ICE from 10am for people to meet our current cohort and find out what we’ve been up to. The course isn’t just for established musicians or film makers. It can be for people who are unsure of what they want to do, but want to try something different, want to build their confidence and make new friends. Please contact Dan to book your place on 02920 140041 or dan@recrock.co.uk for more information, or to receive an application form.